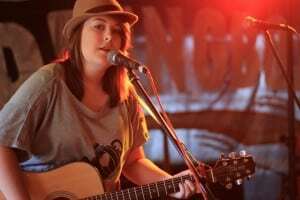 It seems the season of the singer-songwriter is upon us once again, with troubadours taking up their guitars and cutting their lonely paths across venues throughout the country. We got the chance to chat to one of the youngest and brightest of Yorkshire’s latest crop of would be minstrels. Here to discuss a family legacy of music, the balance of school and performing, and a new album ‘FINDING STEVIE’, it’s Stevie Mould. With the diminutive brunette safely sat down with a drink (a soft one of course for the 17 year old, we’re not monsters), we wonder what Stevie is up to at the moment? It’s obvious talking to Stevie, that her years belie a mature head on those shoulders, and it’s a maturity that you can witness in her music as well. We were curious how long she has been playing the guitar. But guitar-playing is not the only skill in Stevie’s arsenal. Anyone who has had the privilege of seeing Stevie perform live will attest to the astonishing range, and soulful sound of her voice. Stevie Mould possesses a powerful set of pipes for sure, but it’s also a unique voice that one doesn’t see coming when glancing at the pixie-esque young woman. Stevie tells us about her influences and there is a definite country theme to the artists that inspire her the most. With an album out and a fast-growing and devoted following, we were curious to find out how she would categorise her own music. Stevie Mould leaves us with a look at what the remainder of 2014 and the future will have in store for her. And with that we wave farewell to the entirely adorable, and talented Stevie Mould, a mature head on young shoulders with a bright future ahead.